I am most curious about the windup shadow on the right hand side, but couldn’t make it fit into my story. Mine seems a little bleak this week, but decided to go with that rather than the more obvious funny slant. Go figure. Shadows fell across the stage; it was the golden hour film crews live for. Watching the light fade, John knew his life had taken a turn for the absurd. As a child, he dreamed of fame as a classical pianist. His music would make people weep, his performances sublime. Instead, he was a joke – a player in a group of kid’s performers; his dream dying a little more with each song. 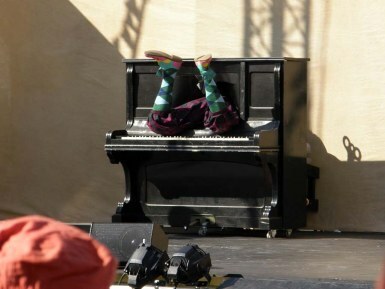 Upside down now within the piano, tears ran to his hairline, his knees pounding out the old Ragtime Blues. Dreams, like the golden hour, slip away all too soon. This entry was posted in Flash Friday Fiction, writing and tagged Flash Fiction, piano, ragtime. Bookmark the permalink. Erin I wonder about the winder as well. Perhaps John will read your post and clue us in. If he does let me know what he tells you. He did respond – it’s in my comments section – the secret revealed! I’m sure he’d at least get into the finals of Britain’s Got Talent. Ha! I’ve got to watch that ome day…. I liked this bleak approach! Thanks, Freya! We all have our own angles. Thank you, Sandra! I hope all is well with you. The performer in the piano was a clockwork boy. Prior to diving into the piano he walked about the stage with a big key in his back and needed winding up from time to time. The shadow of the key is proof that the piano is actually a fake prop with no top, so the sun shining through casts the shadow of the key on the back flat. Thank you! It wasn’t an easy prompt. Sue me! I like dark…at least in the literary sense. Thanks, John. I appreciate the back story as well. A different take on the prompt, most of which have been humorous. Struck the right tone for me. I like your take on this prompt and was able to connect with your character. Well done. How many of us have had dreams (even without talent, per say) similar? Nicely done! Thanks, Troy. I will read yours next. I love that quote – thank you for reading! Well done. I started singing “Send in the Clowns” to myself. Poetic and sad; if that’s what you were going for, congratulations. Erin, well written. I love this line, “his dream dying a little more with each song.” Ooh, that one really touched me.